As you may have seen via our social media, we are currently tackling our entryway! We replaced our door a few months ago and recently had our floors done! We are jumping right into our Waste Less series with an easy and impactful swap—cloth napkins instead of paper ones at home. This is one of those projects we weren’t sure we wanted to do, so we sat on it for 10 months. 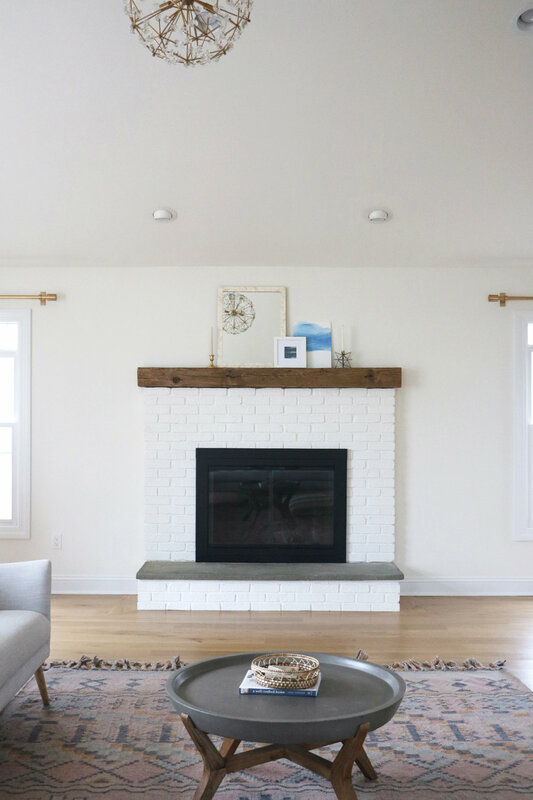 When we did the family room renovation we talked about painting the fireplace brick, but weren’t 100% on board and didn’t want to regret it! So, we replaced the mantle with the reclaimed wood beam and lived in our renovated family room for 10 months. Last week we decided, “let’s paint it!”. I’m SO glad we did and I’m also glad we felt super confident that it was the right decision. Guys, we MADE this!! There’s nothing like having pieces up in your home that you put time and effort into, especially when it was done as a family. It’s a meaningful piece that I have to say is quite beautiful (maybe I'm biased :)). See what we're up to on instagram! © 2019 root + dwell.